When the great ship, the RMS Titanic went down, the captain, Edward Smith, went down with his glorious ship, which is the tradition that is an unspoken rule of the sea. Other than Captain Smith, the First officer, William Murdoch was also dead, and while the circumstances of his death are up in the air because some witnesses swore he killed himself, he was still dead and unable to answer the questions that everyone had once the Carpathia got back to New York with the 705 survivors it carried. 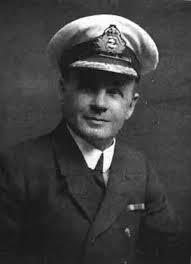 People wanted to know what happened to the Titanic, and the only senior officer left was Charles Herbert Lightoller. Charles Herbert Lightoller came into the world on March 30, 1874. The name of the town he was born in was Chorley, Lancashire, and his mother Sarah did not even get to see her baby boy because she died after she delivered her son. The Lightoller name was well-known one, the family owned a mill named the Lightoller Mill. Life for young Charles Herbert was not that great, he lost his mother after he was born, and shortly thereafter, his father Fred disappeared and headed for the country of New Zealand. Without much of a family life, Lightoller decided that his life would be on the sea, and the very first ship he served on was called the Primrose Hill. Lightoller joined his first ship at the age of 13, and he had a lot of adventures as he was going from one ship to another. On more than one ship Lightoller served on, he ended up running into bad weather, and was even shipwrecked. After he got back to his native soil of England, Lightoller began to train to be an officer, and ended up with a second mate’s certificate. When his ship, the Knight of St. Michael caught on fire, Lightoller risked his life to put it out, and his heroics earned him a promotion. By the year 1900, Lightoller started to work for the White Star Line as a fourth officer on the Medic. After spending time on the Medic, Lightoller went to the Majestic where he met Captain Edward J. Smith, and was given the rank of Third Officer. Together, both Lightoller and Smith ended up leaving the Majestic for the grandest ship that the White Star Line ever had built, the RMS Titanic. Before the Titanic even left Belfast, Captain Smith did some shuffling around of his officers. The first Chief Officer that Smith chose was Henry Wilde, whom he brought over from the RMS Olympic. 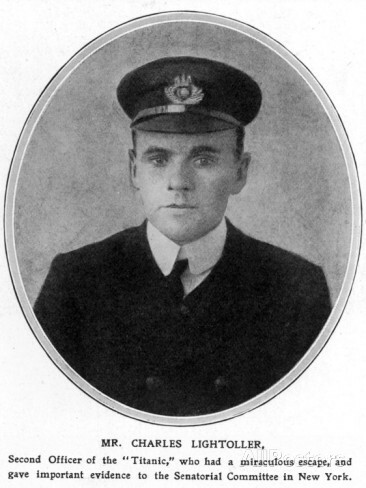 With Wilde joining the crew, Smith then made William Murdoch his First Officer, and Charles Lightoller ended up as Second Officer. The night that Titanic struck the iceberg, Lightoller was actually in his room about to go to bed, and First Officer William Murdoch was on the bridge. Many blame Murdoch for the collision with the iceberg, and many Titanic enthusiasts often wonder what would have happened if Lightoller had remained on the bridge, if the Titanic would have had struck the iceberg at all. Once the collision happened, Lightoller did not even change out of his pajamas, but simply threw clothes over them, and headed for the bridge. However, one Lightoller got to the bridge, he saw no reason to be alarmed, and went back to his cabin. Lightoller stayed in his cabin, and a short time later, the Fourth Officer Joseph Boxhall went to let him know exactly what was going on. The Titanic had hit an iceberg, the mailroom was already underwater, and the ship was in serious trouble. Once back on the bridge, Lightoller began evacuating the Titanic, with the old standard rule of “women and children first.” Lightoller took the rule of the sea very seriously, and made sure that he got as many women and children into lifeboats as possible. There is a report that Lightoller even ordered a group of men out of a lifeboat at gunpoint, and called the men cowards for having filled the lifeboat. After all the lifeboats were gone, Lightoller now faced the fate of the men left, and that was to try and survive. Lightoller got sucked underwater by the bow going down, but then the air rushing out of the ship blew him back to the surface and he swam away from the Titanic. Lightoller ended up on the upside down collapsible B boat, and stayed with it until a group of lifeboats came to take the men off of it.